© 2002, © 2018 by Paul Freeman. Revised 10/6/18. Ft. Pierce Airport, as depicted on the December 1935 Miami Sectional Chart. The date of establishment of this early airport has not been determined. 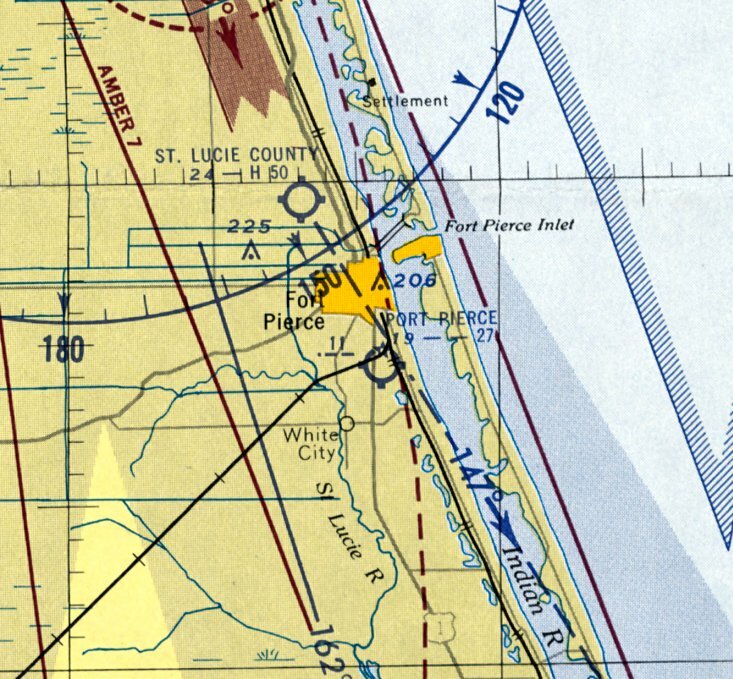 The earliest depiction which has been located of Ft. Pierce Airport was on the December 1935 Miami Sectional Chart. It depicted Ft. Pierce Airport as the Commerce Department's Site 11 along the Miami – Jacksonville Airway. with 3 small buildings on the west side, and an Airway Beacon on the northwest corner. 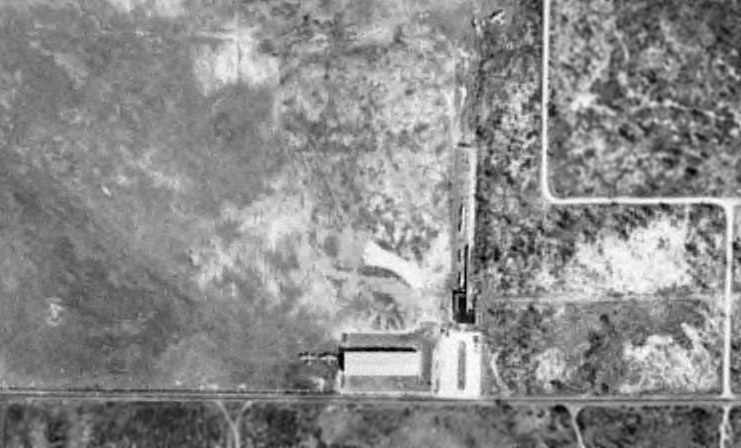 The earliest photo which has been located of Ft. Pierce Airport was a 4/7/50 USGS aerial view. 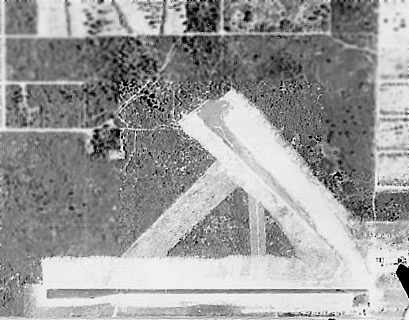 It depicted Ft. Pierce Airport as having 3 unpaved runways, with an airport circular marking in the northwest corner. Several small buildings were located on the west side. 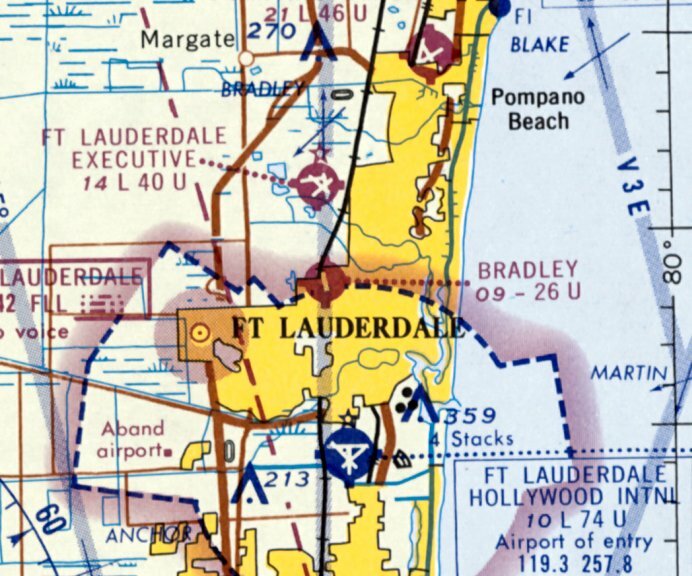 The last aeronautical chart depiction which has been located of Ft. Pierce Airport was on the February 1955 Miami Sectional Chart. It depicted Ft. Pierce Airport as having a 2,700' unpaved runway. 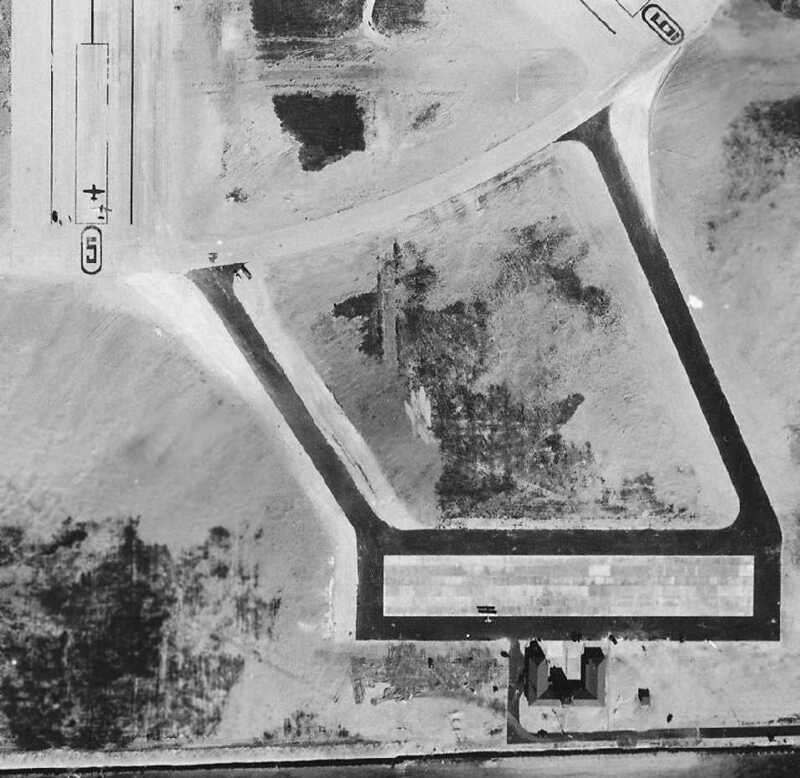 The last photo which has been located of Ft. Pierce Airport was a 1958 aerial view (courtesy of John Crimi). 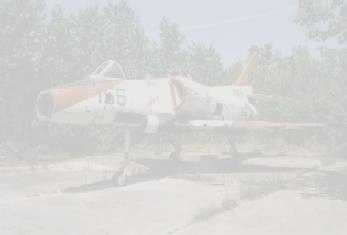 One light single-engine aircraft was visible near a hangar & other small buildings on the west side. 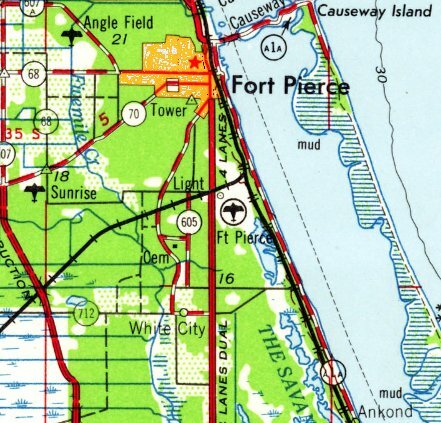 The last topo map depiction which has been located of Ft. Pierce Airport was on the 1959 USGS topo map. 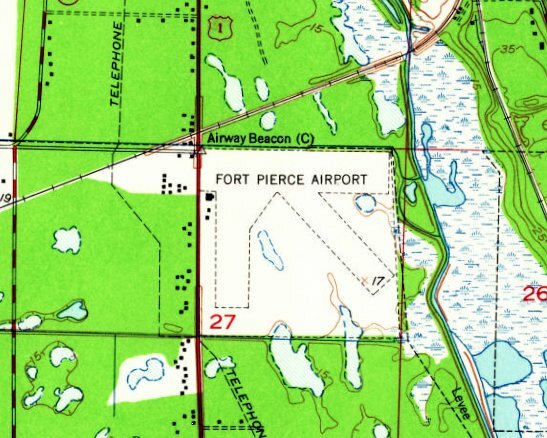 Ft. Pierce Airport was evidently closed at some point between 1955-60, as it was no longer depicted on the February 1960 Miami Sectional Chart. It had evidently been replaced by the larger St. Lucie County Airport to the northwest. 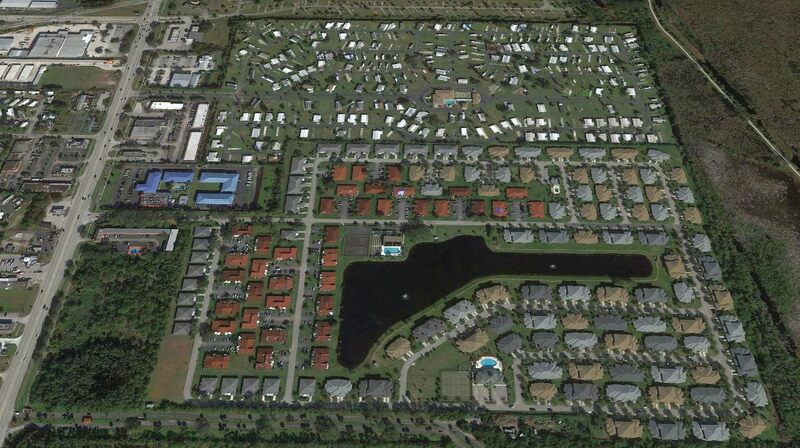 A 2018 aerial view looking north showed no trace remaining of Ft. Pierce Airport, with the property covered by the Sandhill Shores housing development. 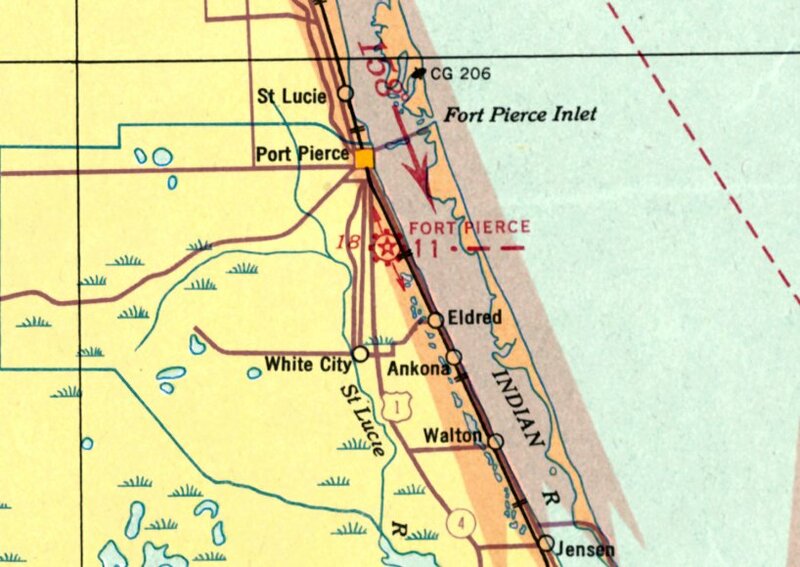 The site of Ft. Pierce Airport is located southeast of the intersection of Route 1 & Pleasure Avenue. Thanks to John Crimi for pointing out this airfield. 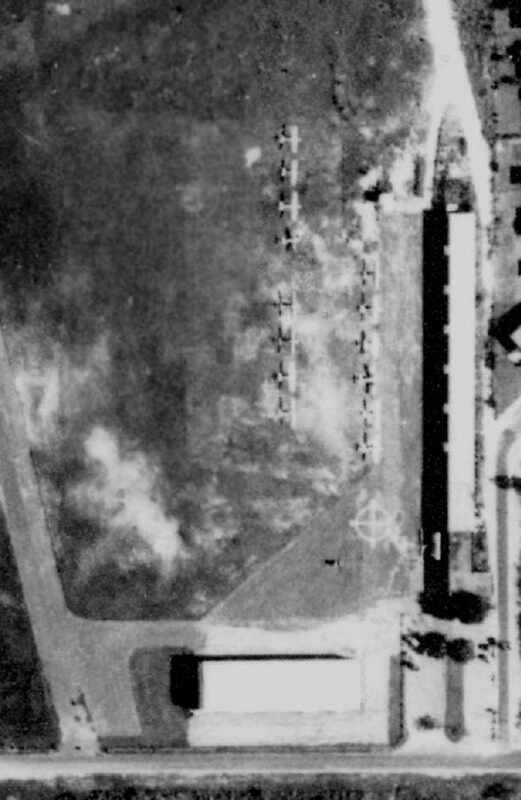 A 3/18/43 National Archives aerial view looking north at MacArthur Field from the 1945 AAF Airfield Directory (courtesy of Brian Rehwinkel). 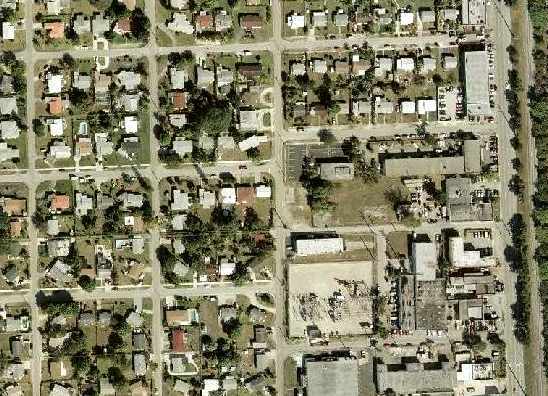 This small general aviation airport was located in Hollywood, just north of the Dade / Broward County line. 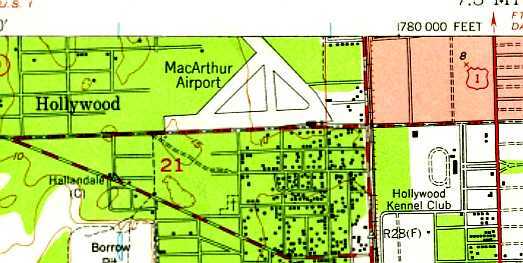 as it was not yet listed among active airfields in The Airport Directory Company's 1941 Airport Directory (according to Chris Kennedy). was a 3/18/43 National Archives aerial view looking north (courtesy of Brian Rehwinkel). 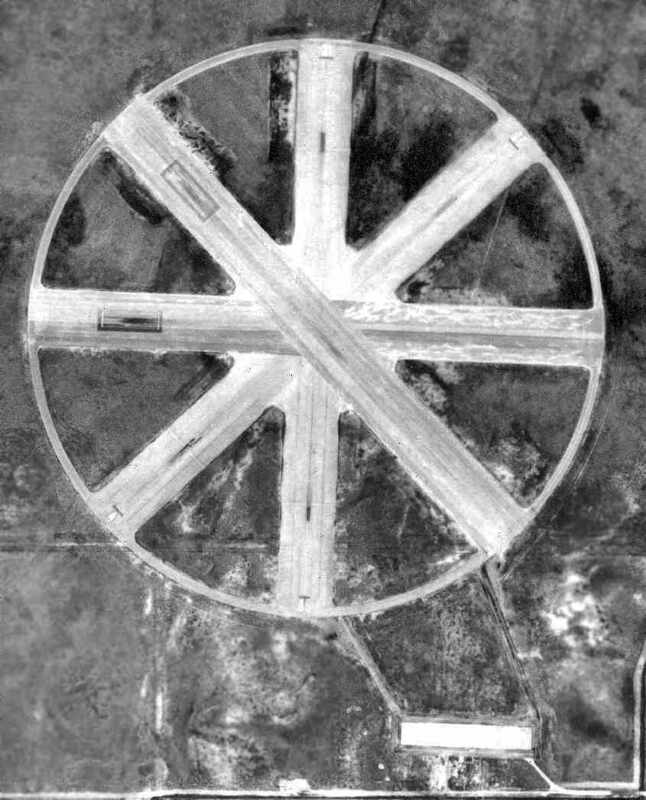 It depicted MacArthur as having 2 unpaved runways connected by 2 taxiways. There did not appear to be any hangars or other buildings on the airfield. A total of 14 light single-engine aircraft were visible on the field, most parked on the southeast corner, and one on the northwest runway end. and you can see how there was still some undeveloped land in this area in early 1943.
was on the August 1943 Miami Sectional Chart (courtesy of Chris Kennedy). It depicted MacArthur as a commercial/municipal airport. described MacArthur as a "class 2" airport, owned & operated by the City of Hollywood. The field was said to have two turf runways, and the manager was listed as N. Holzmark. 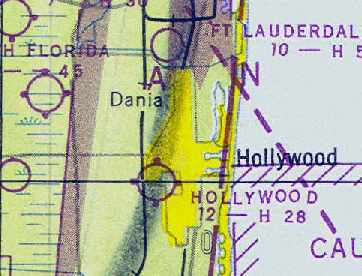 It was still depicted as "MacArthur" Field on the 1945 Miami Sectional Chart (courtesy of John Voss). 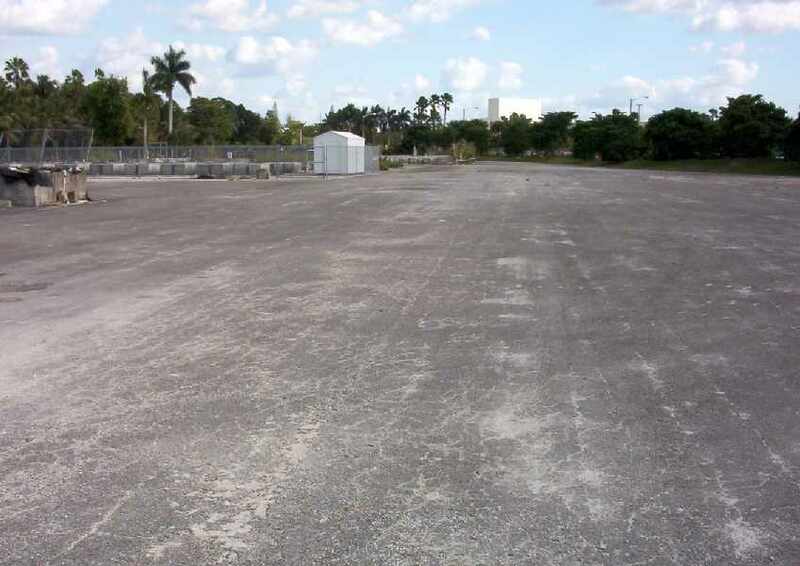 as a 300 acre rectangular property having 2 sand & sod runways: 2,600' east/west & 1,200' northwest/southeast. The field was not said to have any hangars, and to be owned & operated by the City of Hollywood. 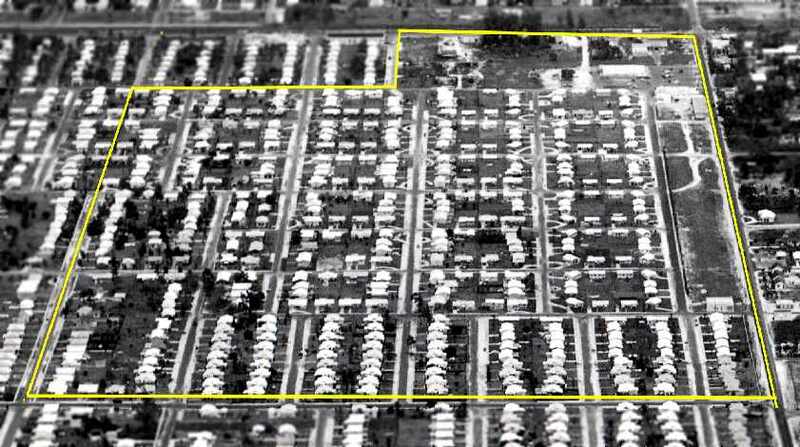 A 7/1/46 aerial photo of MacArthur Field (courtesy of The Florida Department of Transportation, via Brian Rehwinkel). At some point within the past year, the field had apparently gained a paved east/west runway. The grass crosswind runway was still very much evident. Brian Rehwinkel pointed out, "One of the most interesting things about this airport was the fact that it was built in the middle of a city. The airport was actually built with development on all four sides." showed a total of at least 26 aircraft visible parked on the field. The field was evidently was very busy immediately after the end of the Second World War. 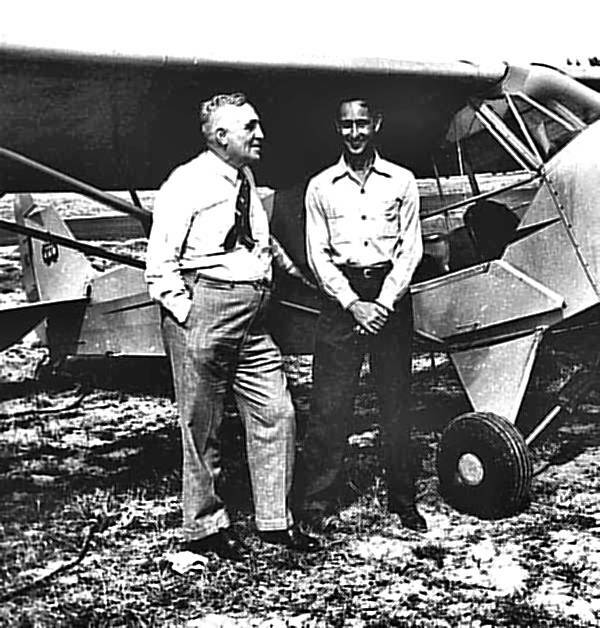 A 1946 photo of William Piper (founder of Piper Aircraft) & Maynard Abrams (manager of Hollywood Airpark) in front of a Piper Cub at Hollwood Airpark. The earliest topo map depiction of MacArthur Field which has been located was on the 1947 USGS topo map. It depicted MacArthur as having 2 runways & 2 taxiways, with some small buildings on the southeast side. as that is how it was labeled on the August 1947 Miami Sectional Chart (courtesy of Chris Kennedy). It was depicted as having a 2,800' hard-surface runway. A 2/26/49 aerial photo of Hollywood Airpark, from the Digital Library Center / University of FL George Smathers Libraries (courtesy of Chris Kennedy). already covering the northwest portion of the former northwest/southeast runway. 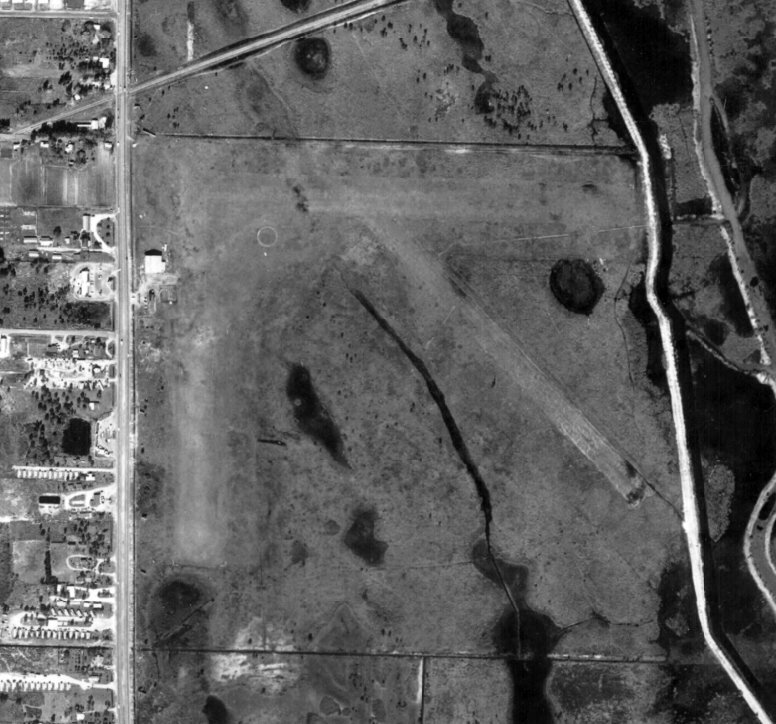 A 5/7/51 USDA aerial photo of Hollywood Airpark (courtesy of The Florida Department of Transportation, via Brian Rehwinkel). 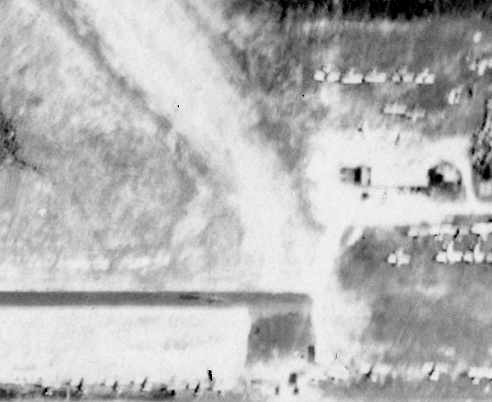 A close-up from the 5/7/51 USDA aerial photo of Hollywood Airpark showed a total of at least 16 aircraft visible parked on the field. described Hollywood Airpark as having 2,400' paved runway. as when I was a kid I used to find old scrap metal buried in the yard & they looked like airplane parts." MacArthur Field was no longer depicted at all. 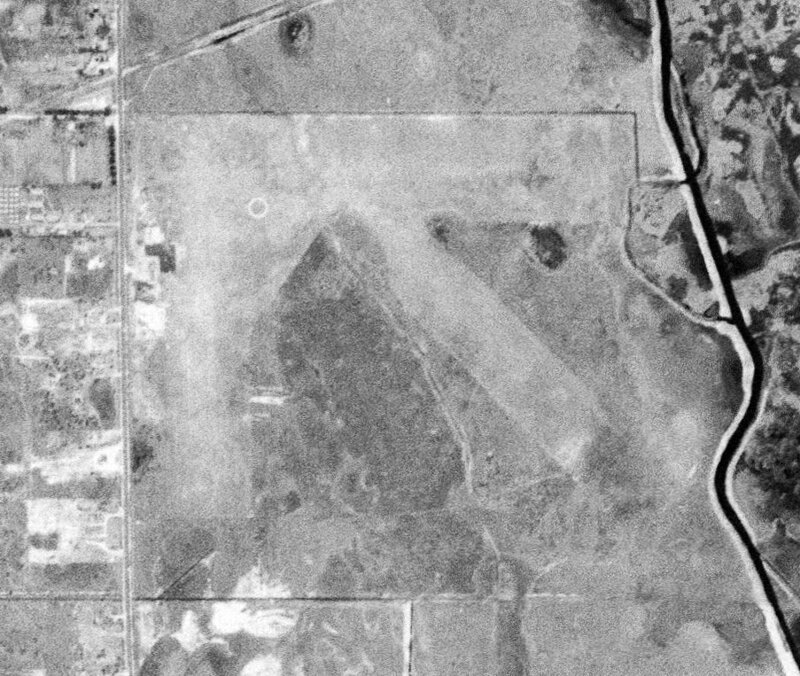 Brian Rehwinkel observed, "Aerial photography from March 1957 shows that housing almost completely covered the airport site. The former east/west runway looked as if it was being used as a residential street. 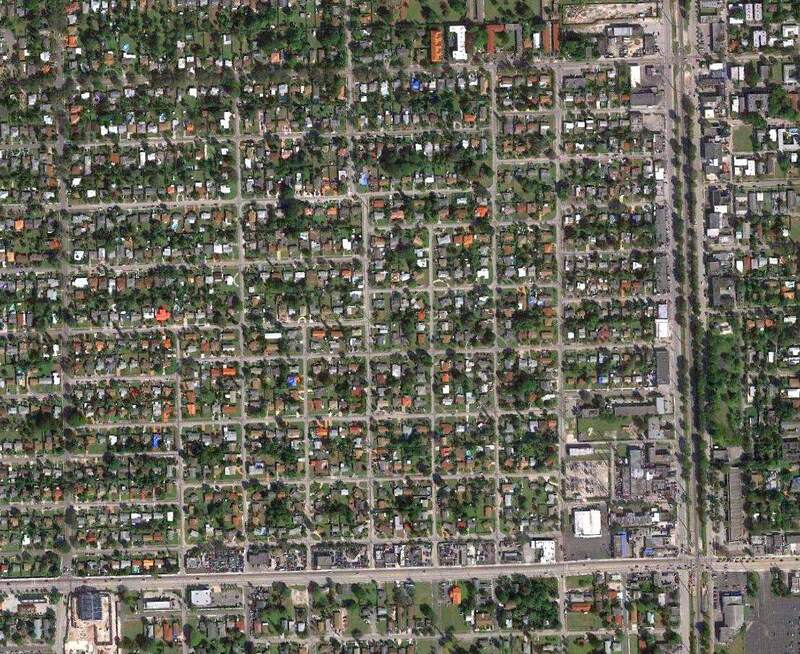 Residential development eventually completely covered this site." 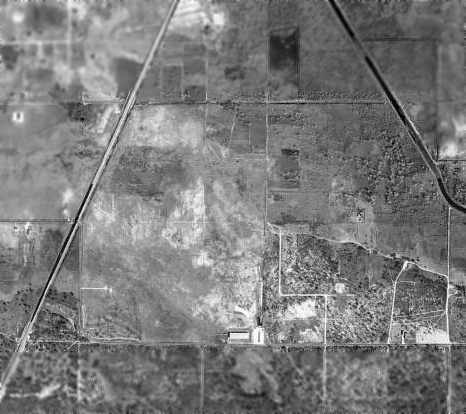 A 1960 aerial view looking east at the site of MacArthur Airport (from the FL DOT, via Brian Rehwinkel). along with at least one former hangar. and no traces of the runways appeared to remain. shows the traces of a few foundations of buildings from the site's days as an airport. A 2016 aerial photo of the MacArthur Field site. 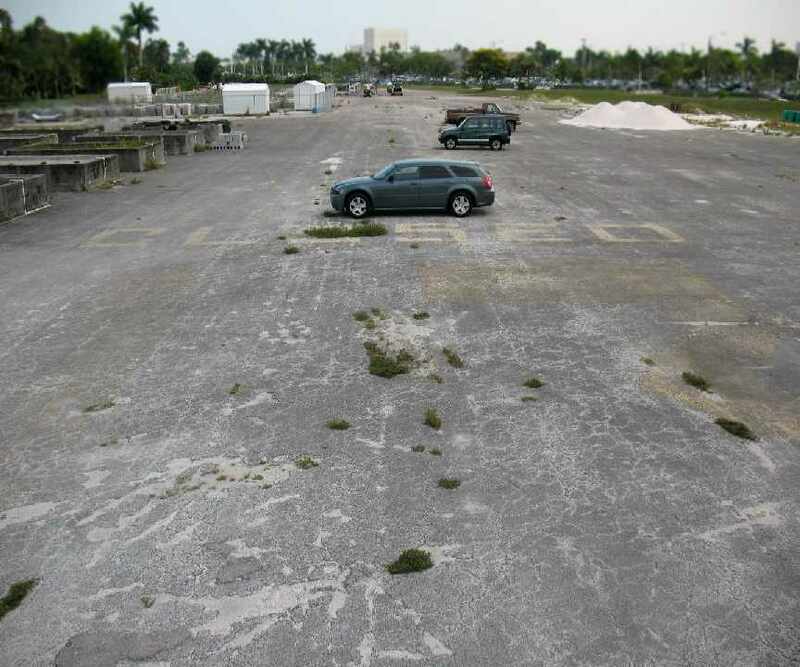 The site of MacArthur Field is located on the Northwest side of the intersection of Moffet Street & South Dixie Highway. "Broward" Field, as depicted on the August 1947 Miami Sectional Chart (courtesy of Chris Kennedy). as it was not yet depicted on a 1940 aerial photo, the February 1945 Miami Sectional Chart, nor on the 1945 USGS topo map. was on the August 1947 Miami Sectional Chart (according to Chris Kennedy). 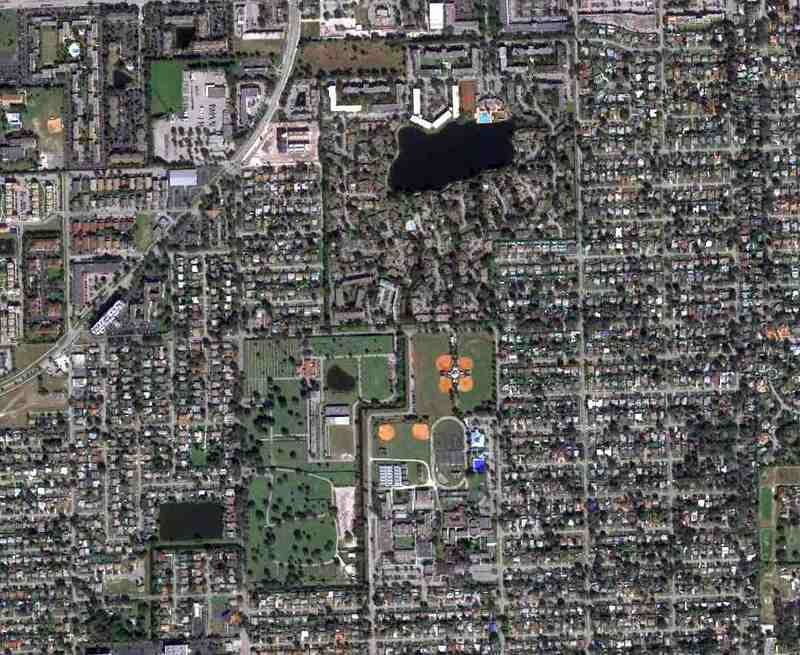 It depicted a "Broward" Field as having a 3,000' unpaved runway. Bradley Field was not yet depicted on the 1949 USGS topo map. from the Digital Library Center / University of Florida George A. Smathers Libraries (courtesy of Chris Kennedy). with a cluster of a few small buildings & hangars on the southeast corner of the field. showing at least four planes parked on the field. 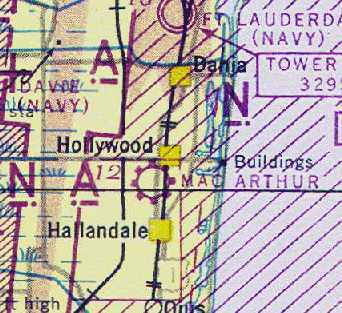 as that is how it was labeled on the August 1954 Miami USAF Sectional Chart (courtesy of Chris Kennedy). as the Aerodromes table described the field as having three runways, with the longest being a 2,600' asphalt strip. Michael Metzger recalled, “I grew up in Wilton Manors Florida just a few miles from Bradley Field & went to school with Ben Bradley Junior around 1957. My dad had a hanger & flew out of Bradley Field & have fond memories of the airport. Ben Bradley Senior had 2 children ... son Ben Junior & a daughter named Piper. 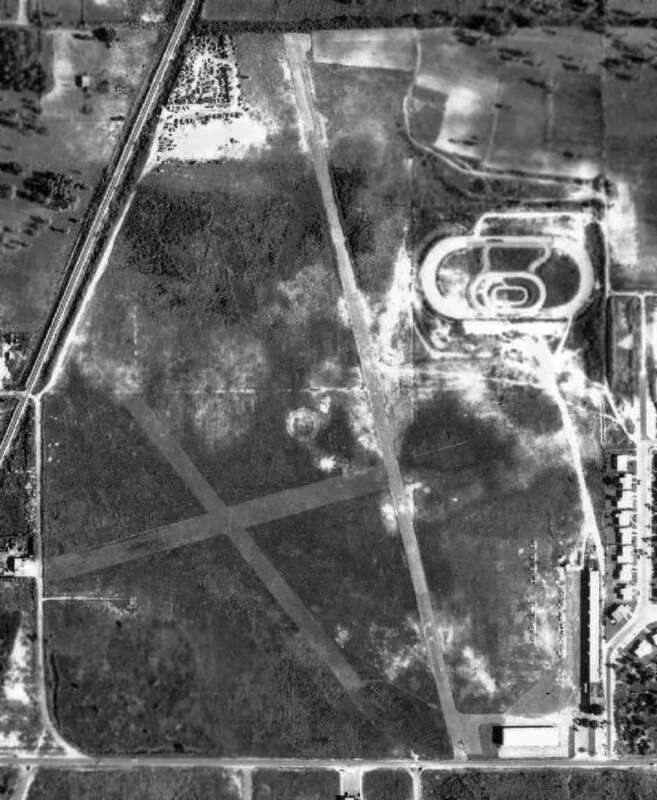 Ben Senior loved planes & mini race cars & he built a oval track on the airport ... clearly visible on [the photo below]. 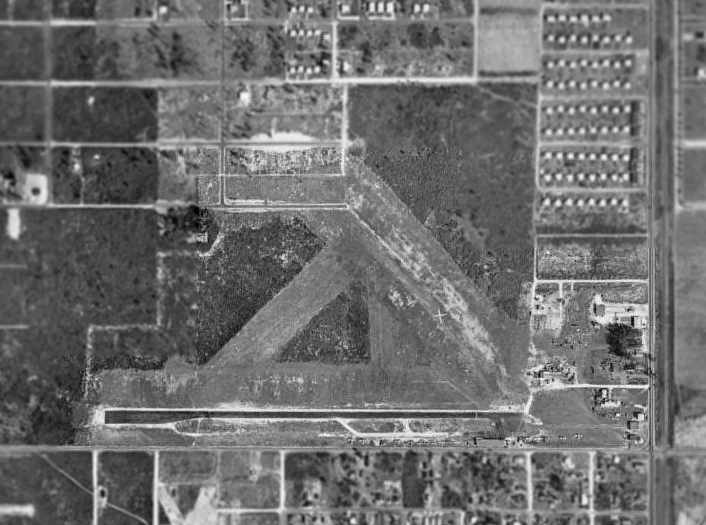 A 9/20/60 aerial photo of Bradley Field (from the FL DOT, courtesy of Brian Rehwinkel). The single paved runway was evident, as well as the two grass runways. showing two hangars as well as a total of at least 14 light aircraft on the field. and 4 unpaved runways on the west side. 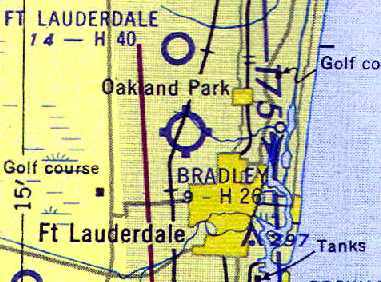 The last depiction which has been located of Bradley Field was on the April 1965 Miami Sectional Chart. 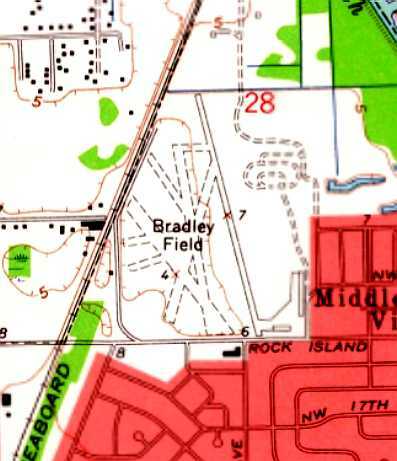 It depicted Bradley as having a 2,600' paved northwest/southeast runway. in which a contributing factor was noted to be the "weeds along runway 3-4' high." 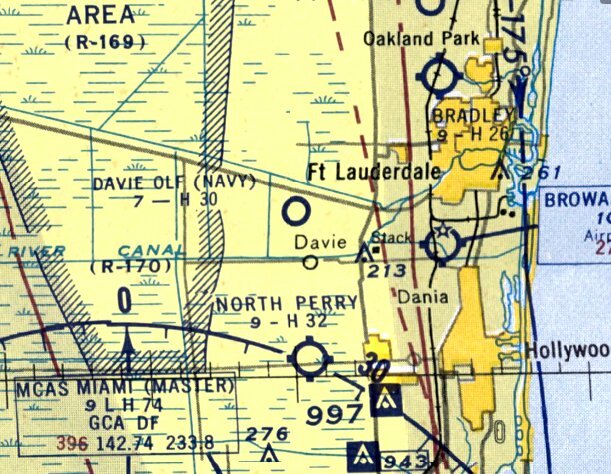 as it was labeled "Abandoned airport" on the March 1966 Miami Sectional Chart (courtesy of Chris Kennedy). which was built along the western side of the airport property. Craig Wilbur recalled, “In 1970, I had jury duty for 'land condemnation' for the I-95 corridor, which only existed in the Miami & Jacksonville areas. At that time, very little remained [of Bradley Field]… just remnants of the old runways. The land was sold to make way for I-95. with a pond having been built along the northwestern side of the former former airfield. Not a trace of the former airport appeared to remain. A 2006 aerial photo annotated by Chris Kennedy to show the outline of the runways of the former Bradley Field. Not a trace of the former airport appears to remain. The site of Bradley Field is located northeast of the intersection of Interstate 95 & Northwest 19th Street. as depicted on a 1942 Navy map for NAS Miami (from the National Archives, via Brian Rehwinkel). Davie NOLF was not yet depicted on the July 1940 Miami Sectional Chart. 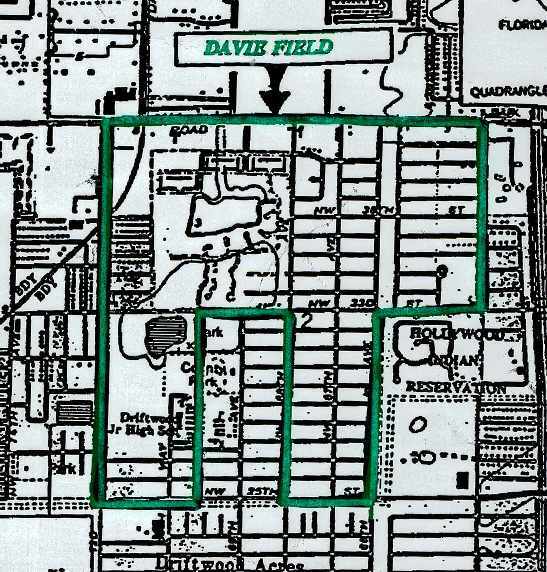 Davie Field was acquired in April 1941 as an outlying "emergency field"
to be used in conjunction with Forman & North Perry Fields (part of the NAS Miami Complex). 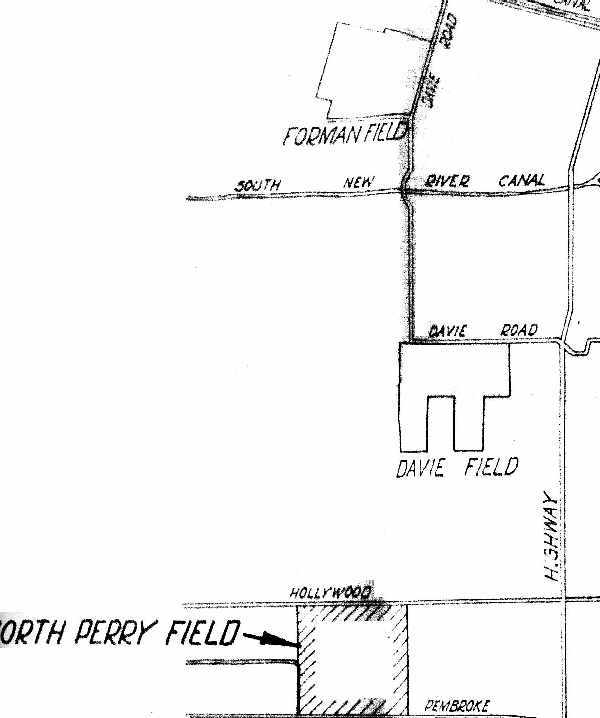 Davie Field was located between Forman Field & North Perry Field, and consisted of sod runways. was on a 1942 Navy map for NAS Miami (from the National Archives, via Brian Rehwinkel). depicted "Davie (Navy)" as an auxiliary airfield. nor listed in the 1945 AAF Airfield Directory (courtesy of Scott Murdock). as that is how "South Florida" was depicted on the August 1947 Miami Sectional Chart (courtesy of Chris Kennedy). It was depicted as having a 4,500' unpaved runway. The field was apparently still being used as a civilian airport at this point. showing at least 8 light aircraft clustered around a few small buildings on the northeast corner of the field. 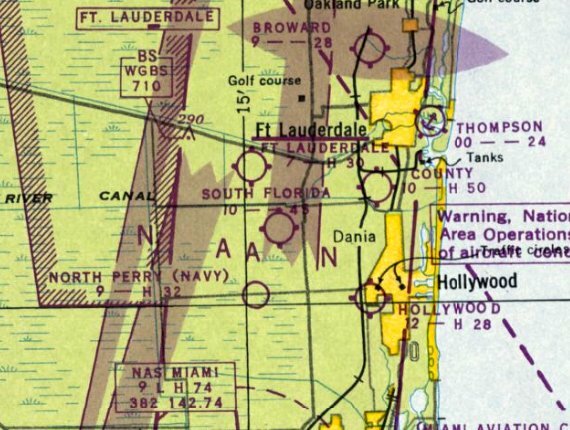 The last aeronautical chart depiction which has been located of South Florida Airport was on the August 1948 Miami Sectional Chart. 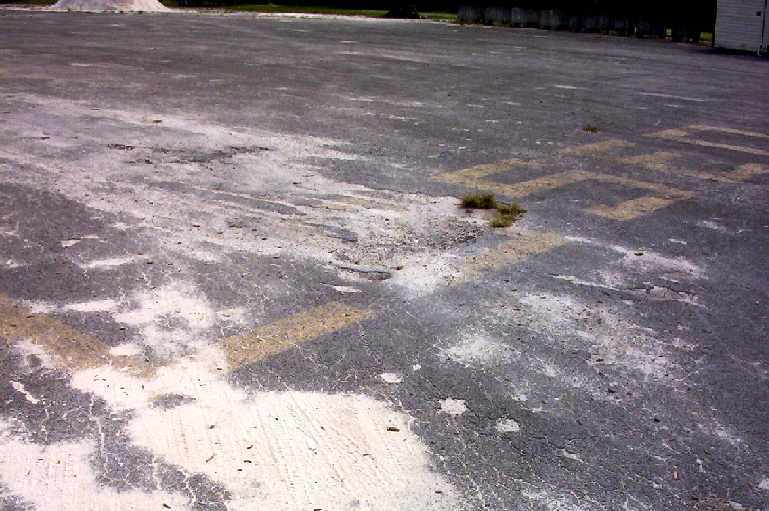 It depicted South Florida Airport as having a 4,500' unpaved runway. 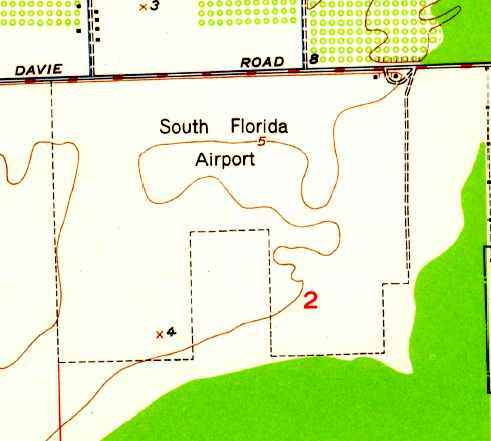 The 1949 USGS topo map depicted South Florida Airport as an irregularly-shaped property outline with 2 small buildings at the northeast side. as it was no longer depicted at all on the February 1949 Miami Sectional Chart. had taken over the location of the former airfield. on a 1983 Army Corps of Engineers map (courtesy of Brian Rehwinkel). 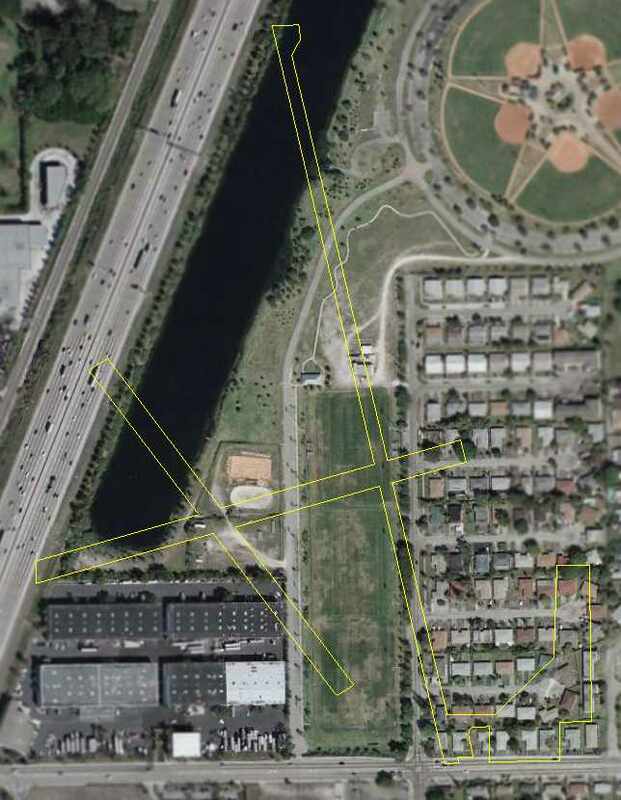 In 2004, Brian Rehwinkel reported that "the site is part of Pembroke Pines, and is covered by residential development & a school." 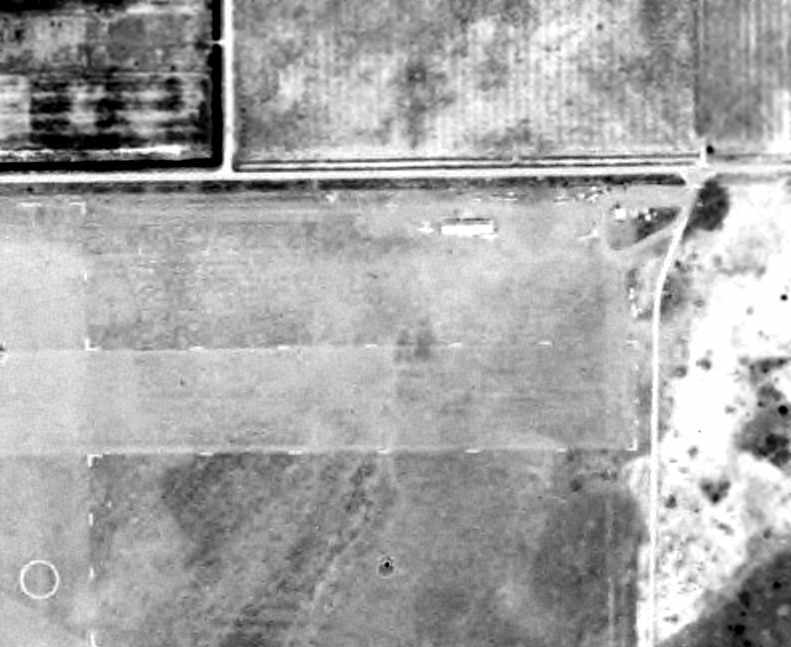 A1/18/14 aerial photo showed no trace remaining of Davie Field. The site of Davie Field is located southeast of the intersection of Davie Road & Stirling Road. Forman Field was not yet depicted on the July 1940 Miami Sectional Chart. This former airfield has gone through a series of confusing name changes & changes of use. Before the airfield was constructed on the property, farmers Hamilton & Blanche Forman ran the 1,000-acre Forman Dairy. Brian Rehwinkel reported, “Forman is an interesting airfield. for use as one of the outlying fields for Naval Aviation training associated with NAS Miami (and NRAB Miami). The land for the field was eventually purchased by the Navy around 1942. A letter from the Forman family indicated most – but not all - of the land was acquired through the Forman family around May 1942. Brian continued, “In its initial setup, Forman Field was apparently a grass field. Sometime in the first part of 1942 (probably late spring), the Navy began construction of the 4 hard-surfaced runways. Since NAS Miami stopped primary training in early 1942, a grass landing field was no longer suitable. 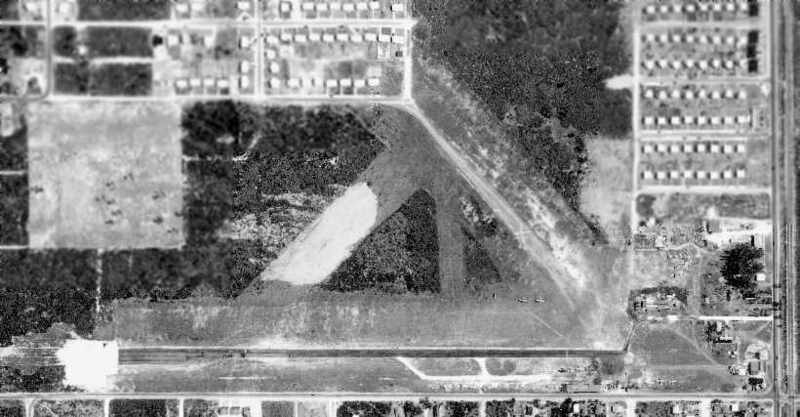 Forman Field was one of 4 satellite airfields used by NAS Fort Lauderdale. along with a circular taxiway running along the periphery of the runways. as it precluded ever having to make a crosswind landing. it was actually quite common among WW2 training airfields. The earliest photo of Forman Field which has been located was a 6/28/42 U.S. Navy aerial view (courtesy of Brian Rehwinkel). A 12/17/42 U.S. Navy photo (courtesy of Brian Rehwinkel) of Forman's “Operation Building”. The only photo which has been located showing aircraft operating at Forman Field was a 12/18/42 U.S. Navy aerial view (courtesy of Brian Rehwinkel). A biplane is visible parked on the south ramp, and a monoplane is visible just over the Runway 5 numbers. 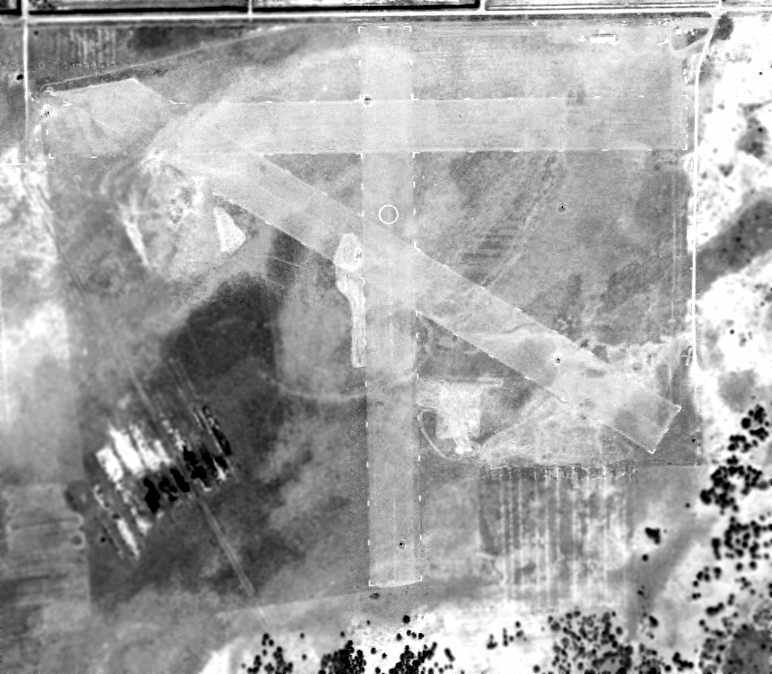 Forman NOLF had two asphalt taxiways leading to the southeast to an asphalt ramp (with a concrete portion in the center). This was a feature that most other WW2-era outlying fields lacked. The earliest aeronautical chart depiction which has been located of Forman Field was on the August 1943 Miami Sectional Chart (courtesy of Chris Kennedy). 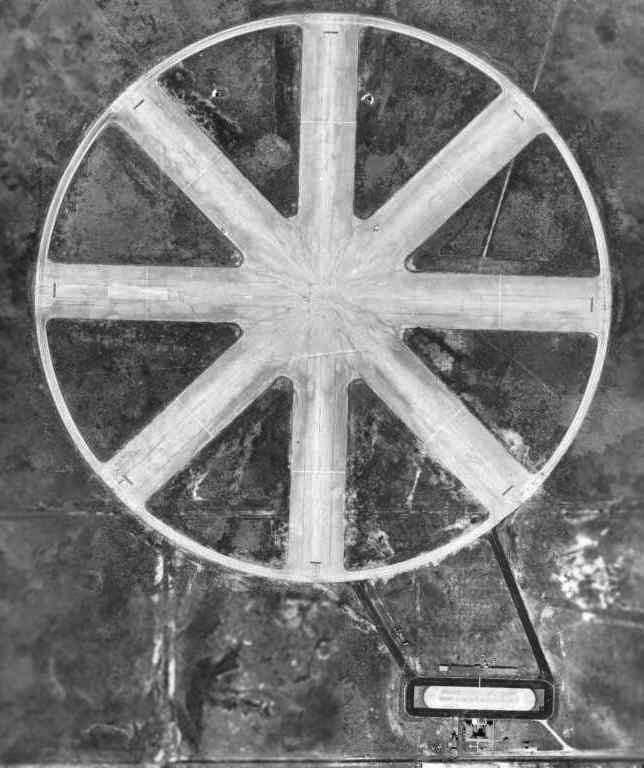 It depicted "Forman (Navy)" as an auxiliary airfield. described "Forman OLF, Navy" as having a 3,000' hard-surfaced runway. on the August 1947 Miami Sectional Chart (courtesy of Chris Kennedy). It was depicted as having a 3,000' hard surface runway. there were no signs of any active use of the airfield at this point. 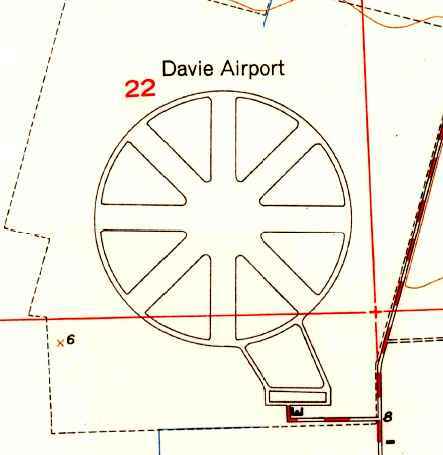 The 1949 USGS topo map depicted Davie Airport with its distinctive wagon-wheel runway layout. “until April 1952 when it was again used by the military. This time it was used by the Marine Corps as an OLF of MCAS Miami. 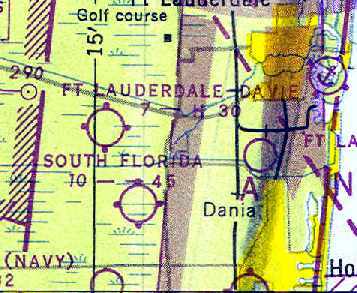 It was depicted as "Davie OLF (Navy)" on the August 1954 Miami Sectional Chart (courtesy of Chris Kennedy). The use of the name "Davie" is quite strange, considering it was the same name as had been used for the nearby Davie NOLF. 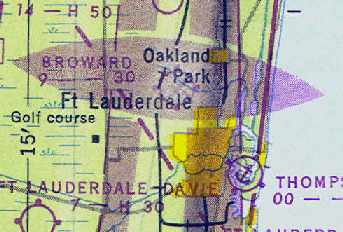 The last aeronautical chart depiction which has been located of "Davie OLF (Navy)" was on the February 1956 Miami Sectional Chart. It depicted Davie as having a 3,000' paved runway. Forman NOLF was no longer depicted at all on the August 1956 Miami Sectional Chart. but the pavement of the runways & taxiways was somewhat decayed. There were no aircraft on the field, or any other indication of any active use of the airfield. Charlie Henault recalled, “My father used to manage a JrU-Tote-Um store across Davie Boulevard from Foreman Field in 1957-60. I would work with him on the weekends while drag races were going on Saturday & Sundays. I was 12 at the time & my job was to sort the soda bottles that were turned in for the 2 cent deposit. There had to be thousands as I would spend all day sorting, both days. When I looked out from the backroom to see what was going on in the front of the store, it was packed. All I can remember the amount of people in the store. They were packed in like sardines. They were all from the races. This was like this all summer long. This was a very popular event for the Broward community. As I got older I would ride my bike to Foreman Field & ride up & down the runways at dusk. I would catch snakes who would crawl on the runways for the heat stored there. I would collect enough to sell to Bill Hass. Bill required 3 burlap bags to make it worth while to him & me & I would be able to get them in 5 or 6 trips. When I got my first car I found a tire dump at the end of the Northwest runway. 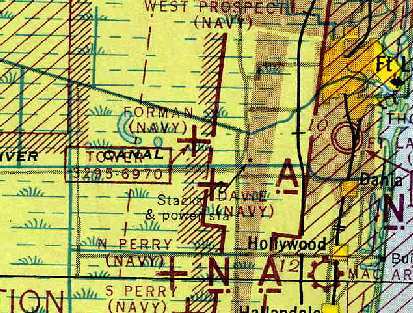 The site of Forman NOLF was depicted as an abandoned airfield on the May 1958 Miami Sectional Chart. According to Brian Rehwinkel, Forman Field was used by the Marine Corps “until October 1958, when MCAS Miami was closed. A circa 1960s National Archives photo (courtesy of Brian Rehwinkel) of several sports cars racing on the abandoned runways of Forman Field. The use of the Forman runways for auto racing was described in the June 1960 issue of Hot Rod Magazine (courtesy of Marty Lineen). that the land would never be reused for anything other than education. when construction was started on the property for Nova Junior High School & Nova Senior High School. These two schools opened in 1963, becoming the first of several schools to occupy the airfield property. A 6/25/66 aerial view (courtesy of Brian Rehwinkel) showed that portions of Forman Field was beginning to be covered by redevelopment. 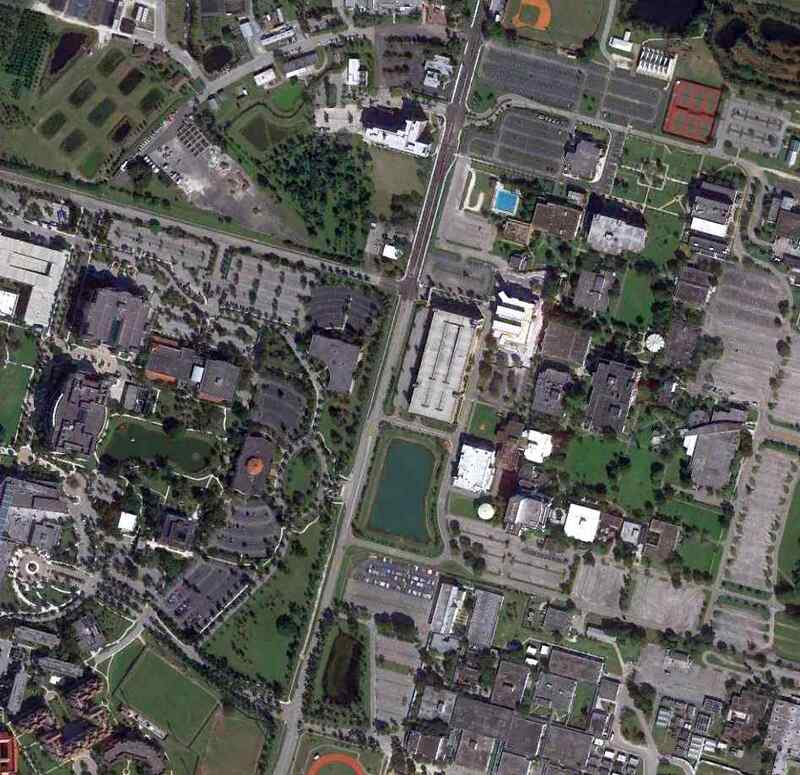 Florida International University, and Florida Atlantic University. Collectively, it became known as the South Florida Education Center. 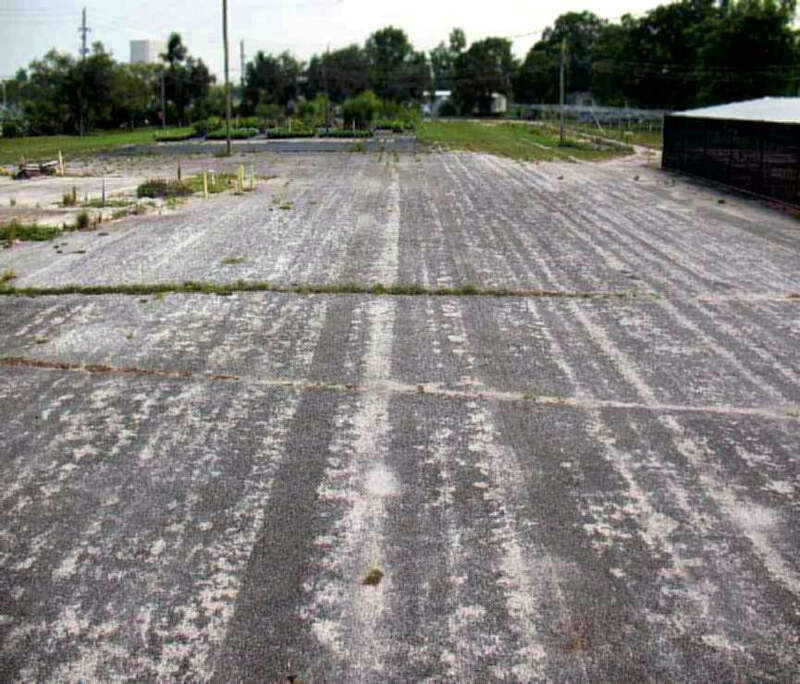 The site of Forman Field in 1982.
which is still visible on the former runway pavement of Forman NOLF. looking toward the center of the "wagon wheel". showing the word “Closed” still visible. Marty reported that “You can see the top half of the '3' in the number 13. An August 2007 photo by Marty Lineen looking at the remains of Forman's Runway 18. Marty reported that “I was able to see a little yellow paint but it does not show in the picture. You can see 2 black marks running beside each other. 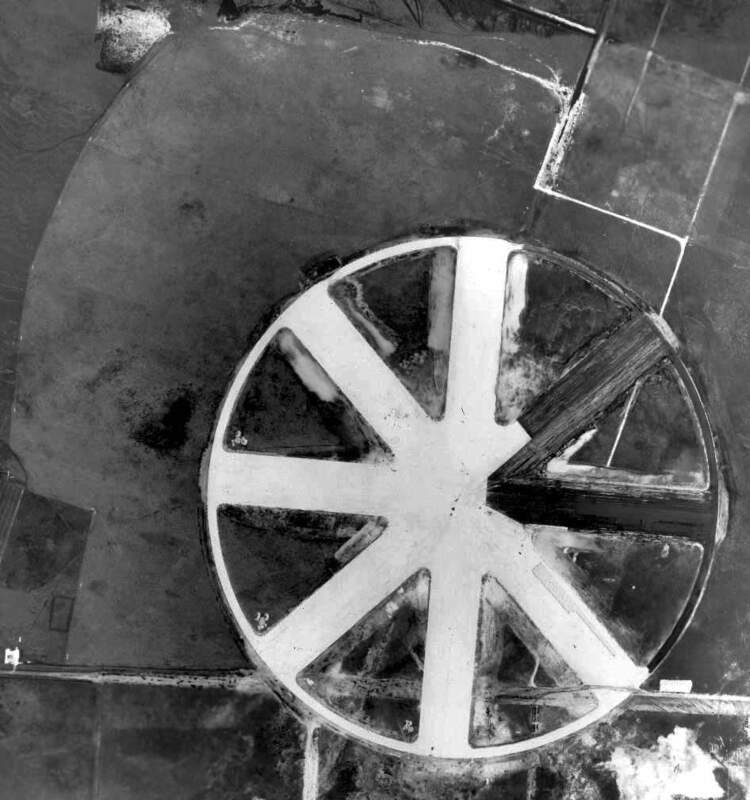 A 1/18/14 aerial photo showed the characteristic circular layout of the Forman airfield remained recognizable along the northwest & southwest portions. The site of Forman Field is located at the present-day intersection of College Avenue & Southwest 30th Street. Thanks to Frank Cruz & Mike Cooper for pointing out Forman Field.